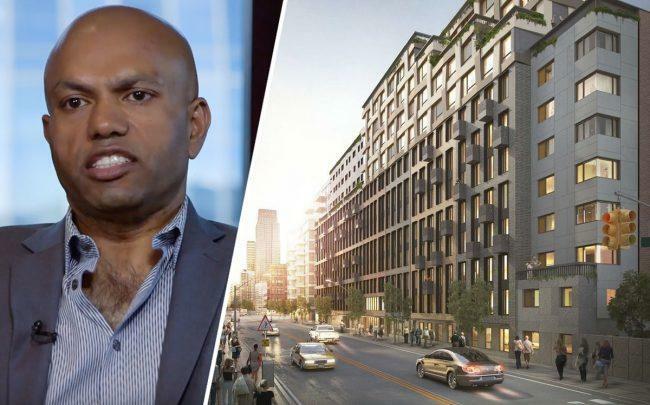 Shibber Khan’s Criterion Group refinanced one of its new apartment complexes in Long Island City. New York Community Bank provided about $79.4 million to the Queens-based developer for its 194-unit Hunters Landing property at 11-35 49th Avenue, according to property records filed Monday. The deal includes a roughly $23.3 million gap mortgage. Criterion and NYCB did not immediately return messages seeking comment. Criterion filed plans in 2015 to construct the 12-story complex, located a couple blocks from the waterfront Gantry Plaza State Park, after picking up the site for $13.5 million. Previous reporting indicated that Jorge Madruga’s Maddd Equities was a partner in the project, but it was not immediately clear if that was still the case. Rents for available apartments range from $2,361 for a two-room studio to $4,800 for a two-bedroom apartment, according to listings on StreetEasy. Nest Seekers International is handling leasing. The developer earlier this year filed plans to build a 255,000-square-foot self-storage facility in Queens, marking a departure for the firm, known mostly for its multifamily developments around the borough.